New York did not collapse. Destroyed by atomic bombs, transformed into a fortress among the ruins, it still fights in the defence of the ideals of Free America. It has started a crusade to restore the human world. At the same time it has usurped the role of guiding the nation, and removed their opponents wherever they can. The city itself has become a fortified police state, one of the few safe places in the ruined world, where you pay for peace with your obedience. Bought this for a friend and this new faction is awesome. The base gives all adjacent units an extra point of protection, and there are some amazing new units here such as the Rocket Launcher, which can travel over hexes and change direction whilst causing a lot of damage. There is also a shotgun tile which causes 3 points of damage in an adjacent tile and then drops off as the range increases - very thematic! 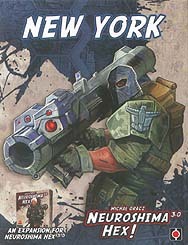 My only issue with it is that it might be too awesome, as we played twice with it and the New York faction won both times... We will have to try it up against the Doomsday Machine and see how it fares.. A great addition to the base game though.